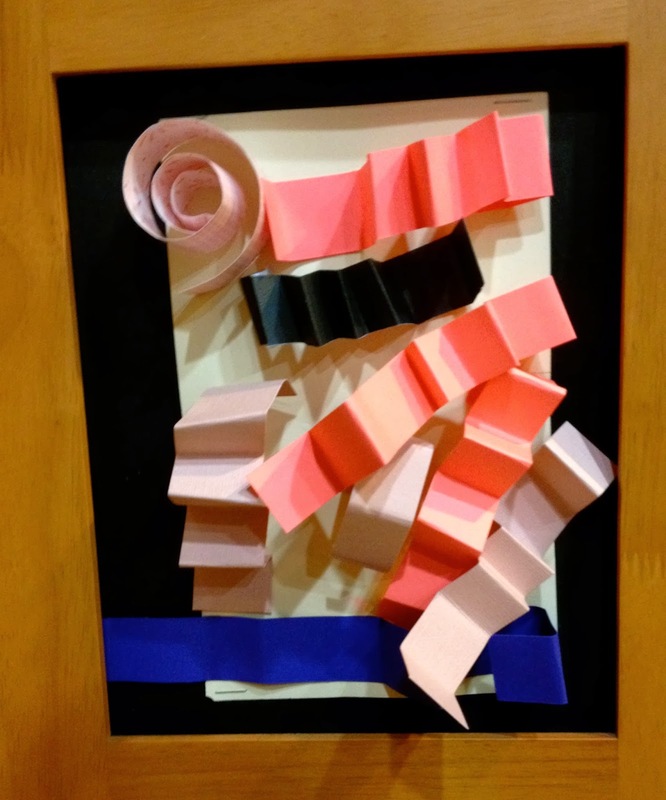 We created these beautiful pieces of art using scrap book paper. First the children practiced holding one end of the paper in their thumb and forefinger as they wound it around a large marker. The process was very tricky and required them to do some serious problem solving as they had to start over several times before they were successful. Once they figured out how to complete the rolling process on a large marker, we tried it on narrow pencils. The next day I showed the children how to fold paper back and forth so that the strips of paper resembled a spring. Some of the children were able to alternate folding motions easily, while others found it to be too challenging. Jackson and Carmen excelled at this particular project, they took on the role of demonstrator in the process of folding and rolling paper. They created many springs and rolls as they showed the other children how to do it for themselves. Throughout the process the children discovered other ways to fold their paper so that they could create their own version of 3D art. 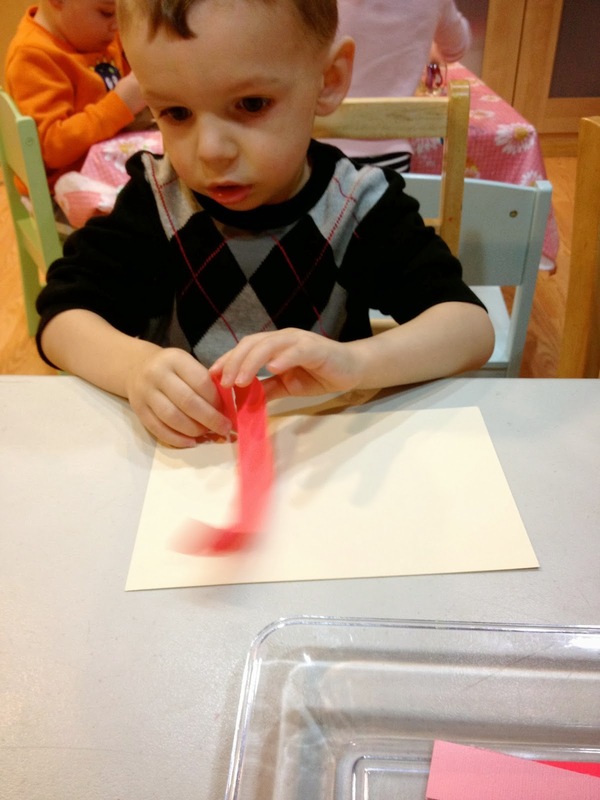 This little guy found the rolling process difficult so he watched the older children and worked at folding the paper his own way. This project was inspired by our paper sculpting work. 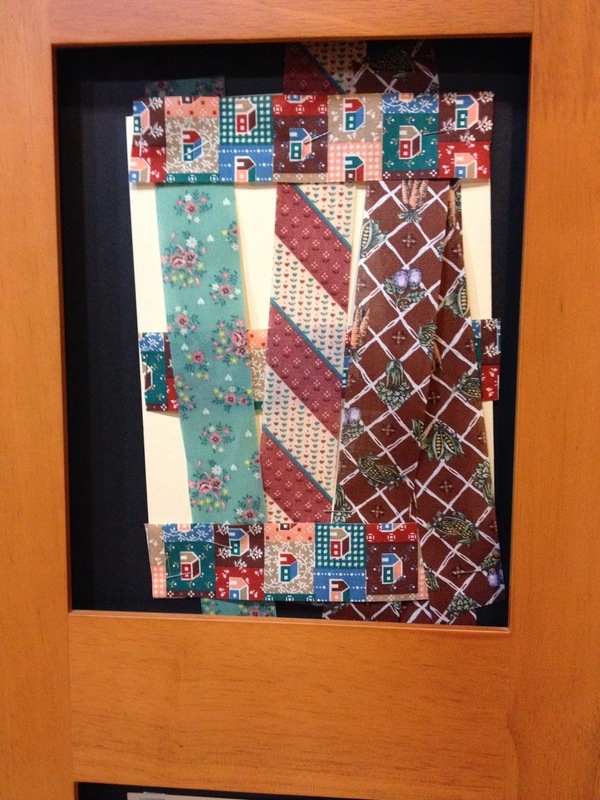 We’ve recently received collections of patterned ribbons, fabric, and paper that the children have enjoyed working with. During our investigation of these new materials we’ve been looking at the many different ways patterns are represented. The children are learning that the key element to all patterns is that they repeat. I wanted to introduce the children to the idea that repetitive patterns can also be represented through movement as they are in the act of weaving. 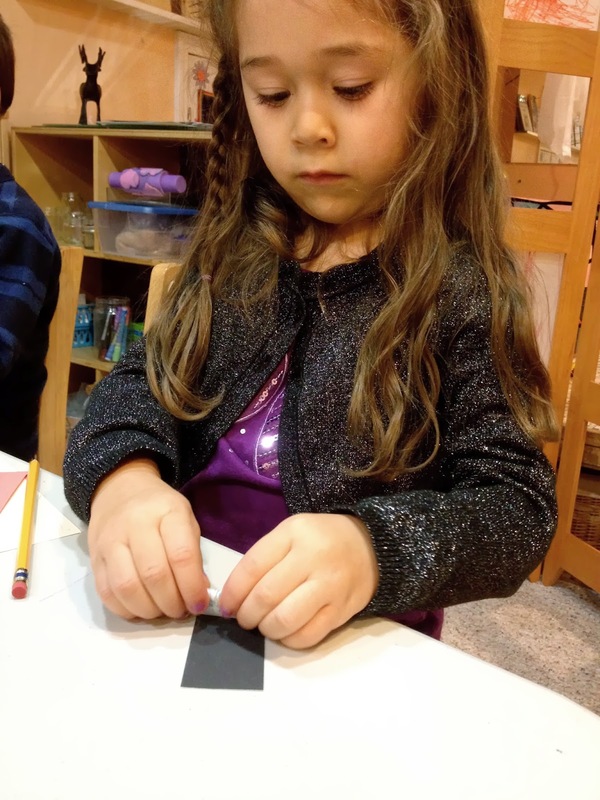 To set this project up, I stapled three ribbons across the width of a piece of card stock then the children took lengths of ribbon and wove them between the stationary pieces. For many, the motion of alternating back and forth between the stationary ribbons was very challenging just as it was in the paper folding project. When the children were finished they had the added challenge of learning how to use a stapler to fasten the pieces in place. We will be revisiting these concepts in the upcoming weeks during our afternoon writing center. I am a domestic engineer conjuring up all sorts of magical experiences for the little people who visit me in my home daycare. I love learning from all the wonderful people I meet along the way and building a sense of community among the families I care for.